Note to Readers: The following letter to the editor was written by Larry Kirsch, an economist and good friend living in Portland, and me. The letter follows on Tom Steyer’s campaign (NeedtoImpeach.com) for impeachment of Donald Trump. 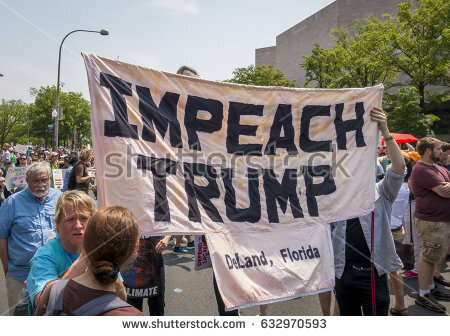 As of now three Democratic representatives—Al Green of Texas, Steve Cohen of Tennessee, and Brad Sherman of California—have separately submitted articles of impeachment. Sherman sees the impeachment movement as “galvanizing those people who are appalled at the recklessness and the incompetency” of Trump. That is our purpose too. Tom Steyer’s priority is to impeach Donald Trump and he’s personally banking on it with a well-funded national ad campaign and petition drive. House Minority Leader Nancy Pelosi’s agenda is to position Dems to retake the House in 2018 and she’s pursuing it by smacking down fellow San Franciscan Steyer as a “distraction.” How misguided is that? Steyer’s impeachment ad and petition have clearly struck a chord and ignited millions of voters seeking to articulate their disgust with Trump through constitutionally prescribed channels. That means holding their elected legislators’ feet to the fire. And therein lies the rub with Leader Pelosi. Recent polling results together with Steyer’s petition show that large numbers of voters want to see Trump’s plunging popular support translated into official sanctions. They are sick of the procedural and political shenanigans that have allowed dishonest, hazardous, and regressive policies to flourish during the Trump presidency. And they are frustrated by the frail response of the Loyal Opposition. Minority Leader Pelosi of all people should know that a win in 2018 will demand the fervent, highly motivated support of millions of activists and rank and file voters. If nothing else, Bernie’s campaign underscored that point unequivocally. Very little passion can come from a strategy of “don’t rock the boat.” Steyer’s approach offers a way to keep voters engaged, energized, and inspired. That is something Pelosi should go out of her way to support, not disparage. I doubt that Steyer’s impeachment effort will in any case be a significant distraction, or that it will be much of a factor in the 2018 elections. Trump’s inadequacies as president are already quite clear, and his base will remain solid no matter what. Democratic and independent voters need positive reasons to get out and vote for Democrats. Well, well. I sent you a supportive note yesterday in which I sought to reference evidence of the sort of visceral reaction that the Mother Jones writer was talking about and today here we are. An honest to god impeachment drive. You–and the others leading the charge–are onto something, Mel. This is the way to get democracy functioning again.